Well, three, actually, and another in the state Senate. Together with other medical professionals, they make up a powerful bloc as Maine confronts its health care future. As a family physician practicing in Skowhegan for more than 30 years, Dr. Ann Dorney knows all too well the mounting challenges of providing health care in Maine. In that time, she has delivered more than 1,000 babies, relishing one of the great joys of her profession. More recently, she joined the staff at Redington-Fairview General Hospital in Skowhegan because private practice was no longer financially feasible, and she has witnessed the devastating impact of substance abuse on many of her patients. “I know more than I want to know about opiate addiction in central Maine,” Dorney said in a recent telephone interview from her home in Norridgewock. Dorney will count on first-hand experience as she assumes a new role as state representative of House District 86 in the 126th Maine Legislature, at a time when health-care reform and social service issues dominate the political landscape and public discourse. Dorney, a Democrat, is one of four medical doctors who will serve this session – the highest number since six physicians served in 1933 and the same number as in 1935, according to records culled by librarians at the Maine State Law and Legislative Reference Library. The doctors are leading an effort to build a health policy caucus of legislators who want to develop bipartisan solutions to health care issues. They are among 14 legislators who work in health-care or social-service fields, a group that includes two emergency medical technicians, a pediatric nurse practitioner, a social worker, a family therapist, a dental hygienist and a pharmacist. House Speaker Mark Eves, D-North Berwick, a family therapist, believes legislators with professional experience will bring additional clout to simmering debates related to the federal Affordable Care Act and health-care reform in general. The issues are complex and range from increasing demand for social services and mental health care, to the possibility of expanding Medicaid coverage provided through MaineCare. Eves compared the potential influence of health-care and social-service professionals to that of business owners on economic development and farmers on agricultural concerns. The doctors also represent Democratic majorities regained in both the House and the Senate in the November elections. 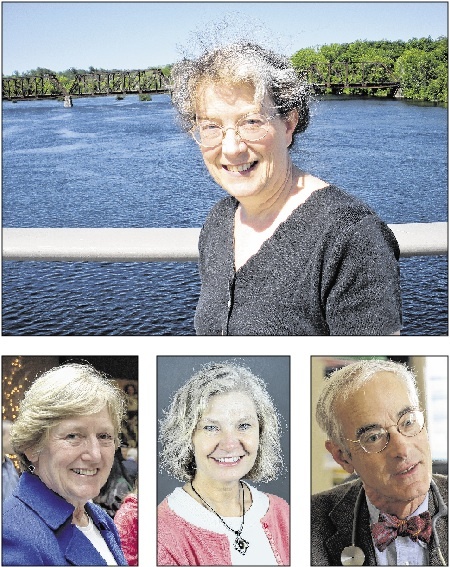 In addition to Dorney, the doctor lawmakers are Rep. Linda Sanborn, D-Gorham, a retired family physician who was elected in November to a third term for House District 130; Rep. Jane Pringle, D-Windham, a retired medical clinic director who is serving her first term for House District 111; and Sen. Geoffrey Gratwick, D-Bangor, a rheumatologist who is serving his first term for Senate District 32. Physician legislators were more common in the 1800s and early 1900s, when several doctors were elected nearly every session, peaking at 13 in 1909. Gordon Smith, executive vice president of the Maine Medical Association, recalls the legislative makeup in the 1960s and 1970s, filling a gap in library records. Dorney has been appointed to the Health and Human Services Committee; Pringle and Gratwick have been appointed to the Insurance and Financial Services Committee, with Gratwick as Senate chairman; and Sanborn has been appointed to the Appropriations Committee, after serving four years on health and human services. “It’s hard to find a better person than Rep. Sanborn to be our spokeswoman on that committee,” Eves said. The administration of Republican Gov. Paul LePage has similar goals but can be expected to have a different approach than the four physicians, each of whom favors some form of universal health care. A high priority for LePage is paying $186 million in MaineCare reimbursements that are owed to Maine’s 39 hospitals and date back to 2009 – a move that would free up $298 million in federal reimbursements to the medical centers. Facing a $100 million revenue shortfall in the current Medicaid budget, LePage also wants to further reduce the number of Mainers covered by MaineCare. So, he’s expected to continue his opposition to expanding Medicaid coverage as funded by the federal government under the Affordable Care Act. Sanborn, 61, understands the downside of out-of-control health care costs. She retired in 2007 when it became financially impossible to maintain a private practice. Sanborn questions the governor’s plan to further reduce the number of Mainers receiving Medicaid benefits, noting that his efforts so far have resulted in a $100 million budget shortfall. She believes greater investment in preventive medicine for high-cost users is the best way to make health care less expensive and more effective. She noted that 5 percent of MaineCare users account for 55 percent of costs, and 20 percent of MaineCare users account for 80 percent of costs. She views the Affordable Care Act as a “step in the right direction” and regrets that LePage refused to create a state-sponsored online health insurance exchange for Mainers who qualify for subsidized plans. Sanborn believes social and mental health services should be considered in concert with medical coverage because they are usually linked. She said increasing the number of Mainers on Medicaid would reduce the amount of charity care that Maine hospitals are required to provide. Pringle, 67, agrees with Sanborn on many counts. She retired in November after serving as the director of medical clinics at Maine Medical Center for more than a decade. Many of her patients were on MaineCare or had no insurance. Many had mental health and substance abuse issues. In the end, she focused on the most challenging cases, known as “superusers,” who were chronically ill largely because they didn’t receive adequate health care in the past. Gratwick, 69, served on the Bangor City Council for nine years, so he understands the political landscape of Maine and how state spending impacts municipal budgets. But he bristles when health care becomes a political issue. Gratwick said he intends to work with the LePage administration, but he hopes to educate Maine lawmakers about the realities of health care today. “We already have universal health care,” Gratwick said, referring to free care provided to the uninsured at hospital emergency rooms. Gratwick said studies have shown that every dollar spent on preventive health care practices saves $7 in acute health care costs. However, he said, lawmakers must take steps to move away from a for-profit system that generates the most money when people are sick and need costly medicines and treatments. Dorney, 59, takes a more holistic approach to creating a healthier Maine. In addition to fully adopting the Affordable Care Act and expanding Medicaid coverage, she believes the state should invest in alternative-energy industries, such as solar and geothermal technologies, and programs to make Maine homes more energy efficient. Both would be good for the environment and create jobs, she said, and employed Mainers are often healthier Mainers.